Students at Uijeongbu High School in Gyeonggi Province dressed up for their yearbook photo shoot Monday, keeping their wacky tradition of creating eye-catching graduation photos. Uijeongbu High is an all-boys school that has made headlines both at home and abroad for its unconventional graduation pictures. The class of 2018 chose to dress up as Hog Rider of the mobile game “Clash of Clans,” a demon clown from the horror movie “It,” Sanrio’s lazy egg character Gudetama, South Korean Skeleton Olympic gold medalist Yun Sung-bin, World Cup goalkeeper sensation Cho Hyun-woo and more. A Uijeongbu High School student dresses up as Hog Rider of the mobile game "Clash of Clans"
A Uijeongbu High School student poses as "Ironman" Skeleton Olympic gold medalist Yun Sung-bin. 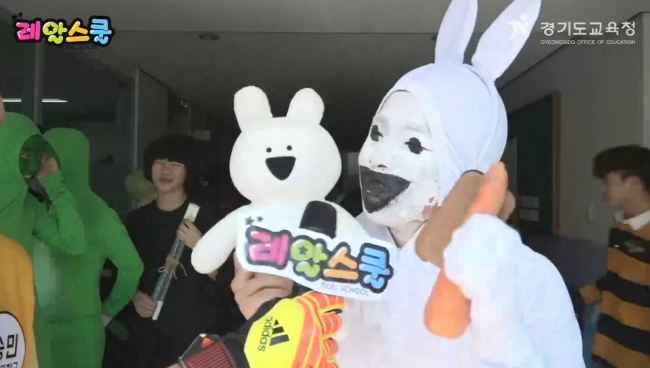 A student dresses up as Line's Over Action Rabbit character and brings a doll along to help explain his costume. Gyeonggido Office of Education livestreamed the photo shoot on Facebook and YouTube from the scene. 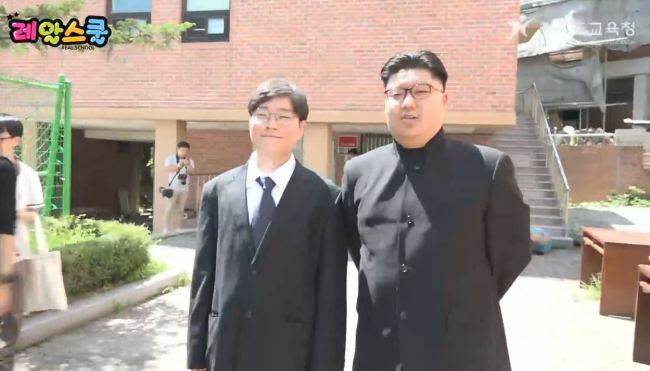 “When I entered Uijeongbu High as a freshman three years ago, my friends who went to other schools wanted to know what I was going to be for the yearbook shoot three years later,” said Kim Ye-seong, the student president who was interviewed live, emphasizing how the school is known for the yearbook tradition. “But because our costume choices reflect the highlights of our graduating year, we often end up brainstorming only a few days before the shoot,” Kim said. Uijeongbu High students traditionally dress up in a way that illustrates the year’s news highlights. The use of body paint and comical gender switches are common for the transformation. One student parodied Samsung Electronics’ Vice Chairman Lee Jae-yong applying lip balm at a hearing over his alleged collusion with impeached ex-President Park Geun-hye. 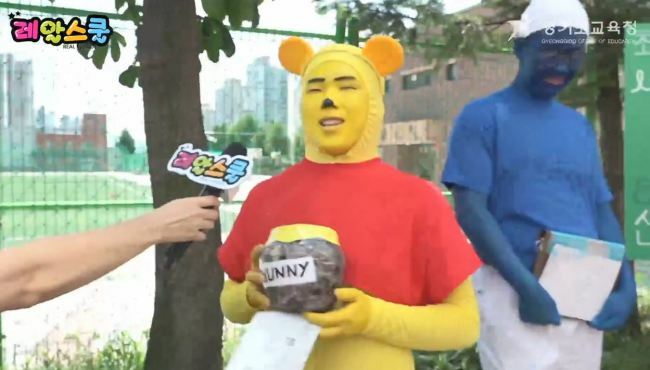 Another wore a braided wig and sat down in front of a meat grill to copy K-pop singer Hwasa’s widely circulated meokbang on the TV program “I Live Alone.” Others splashed on body paint and became Winnie the Pooh, Super Mario and Luigi, Buldak Spicy Ramen and more. Samsung Electronics' Vice Chairman Lee Jae-yong's lip balm became a trending topic when he repeatedly applied it at a hearing over his alleged collusion with impeached ex-President Park Geun-hye. A Uijeongbu High School student immitates K-pop singer Hwasa's meat meokbang, which became famous after it aired on TV program "I Live Alone." Winnie the Pooh, what more to say. South Korean President Moon Jae-in and North Korean leader Kim Jong-un made a historic summit at Panmunjom in 2018. Two students reenacted South Korean President Moon Jae-in and North Korean leader Kim Jong-un’s historic handshake, complete with a roll of toilet paper to draw a line on the ground like the division line between South and North Korea.